Do you think you could make this with almond milk? That sounds so yummy! How ’bout banana ice cream the same way? I doubt you would need any sweetener. Thanks for the recipe! Actually, you can make a similar version of banana ice cream by just pureeing frozen bananas, no other ingredients needed. Can’t wait to try the strawberry ice cream, nothing beats “real” homemade strawberry ice cream made with local strawberries, but it definitely takes more then 7 minutes and contains more sugar. Love this quick low sugar option. Yes, banana – great idea! 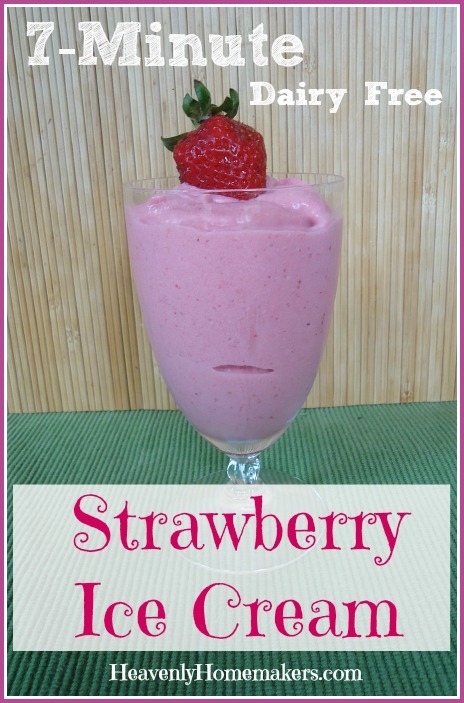 I’ve been looking for something frugal to serve for a dessert when we have a large family come to visit this weekend–and I have tons of frozen strawberries from last year in my freezer! Thank you for this recipe! Are you still using the KitchenAid 9 cup processor? I need a new food processor desperately…I want one that works! Laura, you always put together such fun looking treats and thoughtful posts. As I saw another recipe here at your site that called for stevia, it had me wondering if you’ve done an in-depth posting about stevia- why you choose to use it for your family, how you think it tastes, things like that. I’ve been researching herbs (not just stevia) and was surprised to discover that south american tribes have used stevia for centuries as a form of birth control. A quick google, and sure enough, people are chattering about this very thing and how many people who are using stevia are finding themselves unable to conceive. Now for people like you and I who are (likely) past the childbearing years it doesn’t matter so much, but SO many people love and follow your site, and it seems to me it would be worth addressing this- and at the very least noting something somewhere about the risks of using stevia. I’ve opted not to use it for my family. With a teenage girl and a pre-teen boy, this just sounds like a really bad idea, and I’d rather deal with real cane sugar, honey and maple syrup, where I KNOW I’m not causing some kind of hormone problems down the road. I check in at your site almost every day, and I find such inspiration here, but the recent increase in stevia has me concerned for your other faithful followers who like to see what you do, and then implement it in their own homes. I realllly appreciate you sharing this. I’ve researched it, but definitely had not heard this information. I hate that there’s so much contradictory info out there. My understanding was that stevia is an herb, and therefore great for us. I need to spend some time really looking into this so I make sure I’m recommending something that is okay for everyone. Thank you for sharing! My husband did some research and found the same thing that stevia “might” act as an abortifaciant. Since we are not past the childbearing years (hopefully:) we don’t use it and never have. In fairness, we are probably overly cautious since we had two miscarriages several years ago. I agree with Laura. It’s frustrating that there is so much conflicting info. I’m glad that someone mentioned the possible side effects of stevia. You have to really be careful with herbs. A lot of people assume that just because they’re an herb, they’re harmless. Modern drugs are created from synthesizing herbs etc. because you can’t patent “Mother Nature”. This recipe looks so good, I am going to try it soon. I combined a mango ice cream recipe with your recipe to create delicious LOW SUGAR mango faux fro-yo. I used a 24oz bag of frozen mangos (Trader Joe’s), 2 cups of plain whole milk yogurt and honey to taste, then blended in my food processor till smooth. I froze the leftovers in smoothie pop molds.